This is a delicious and nutritious chocolate chip banana smoothie that will jump start your morning! If you make your own almond milk, this is a fully raw recipe. Store bought also works, but the option of fully raw smoothies is always great for us vegans! This also serves up good fats, fibre, and protein to start your day off on the right foot! You just might end up having a chocolate chip banana smoothie every day for breakfast this week… don’t say I didn’t warn you! If you’re totally bananas for this flavor combination, you could pair it with vegan chocolate chip banana waffles. 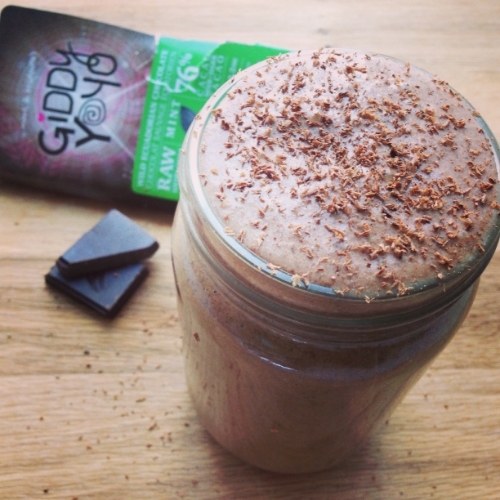 This is a delicious and nutritious breakfast smoothie that will jump start your morning! In a high-powered blender, combine all ingredients until smooth. You can either cut the recipe in half if you want a small portion, or it keeps well in the fridge for another smoothie the next morning!